Someone asked me to write down the answer the other day: so she could use it in the Transgender Day of Remembrance event she was organising in Oval House. "I am my daughters’ dad and my grandson’s grandma. I’m my own father and my own mother too. I embody a new way of being in the world”. And it became a statement on a piece of paper beside the names. The names in the ceremony: where we read out the names of all the trans people who’ve been murdered in the past year for being who they are. There are two hundred and twenty three this year and beside each piece of paper was a tea light and a box of matches. When we entered the space we found ourselves next to a group of each: and our task was to make sure that all the lights beside us were lit. And then the electric lights were dimmed and we began to read out the the names. And the statements. And blow out the candles one by one. Until we were in darkness. One of my names was that of an eight year old child. They were beaten to death by their parents for being too ‘effeminate’. Other bits of paper just said “Blow out the candle”. And that was hard to do. Because these marked the trans* women who were murdered and who had no name. Snuffing out their light felt like an enormous crime. And every now and again in the encroaching darkness a statement would be read out: sometimes an expression of suffering. Sometimes a message of defiance. Sometimes a message of hope. It was very strange, somehow, to hear a perfect stranger read out mine. And when all the lights had been put out, and all the deaths acknowledged, one by one the lights were lit again. 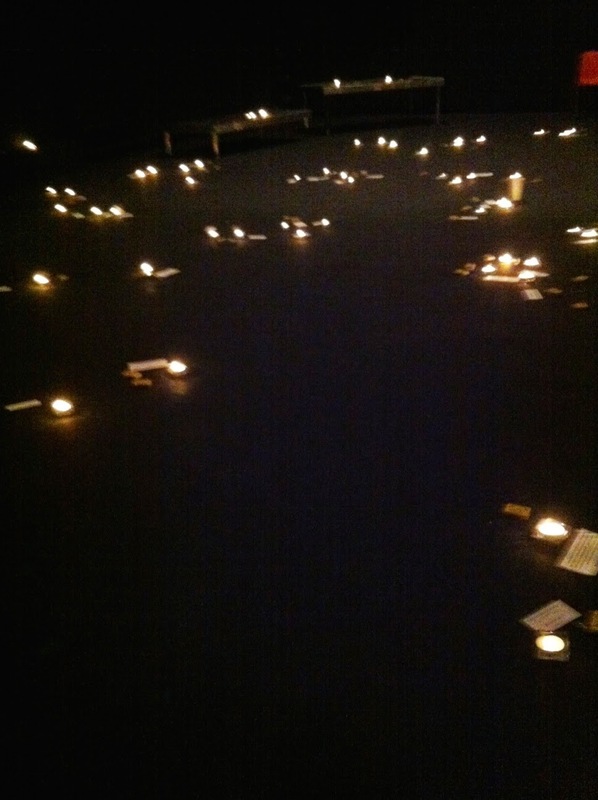 And there we were, surrounded by little islands of light in an ocean of darkness. And everyone left in silence. I saw the man who had read out my statement carefully putting it in his inner pocket. So I told him it was mine and thanked him for reading it. He looked me very firmly in the eye. As if what i had written meant something very profound to him. And he shook me firmly by the hand. And then left without saying a word. And I knew I should go too. Only I couldn’t bear to leave, somehow. I couldn’t bear to leave all those lives behind, and the thought of what they achieved in the world. And I thought of my own life, and how lucky i am still to have it; and began, yet again, to deal with the paranoia of the thought that I may be making myself a target and may even end up as one of those names some day. And I thought of my family and all they, too have suffered. Suffered because of me being who I am. Not that it’s my fault or their fault or anyone’s fault: just a function of the hatred and the prejudice and the fear we all live in..
And when I eventually got up to leave i was hobbling. My legs just so sore with all the hatred we have absorbed together. And I wondered if there’s a candle to commemorate them. A candle to make them better. Knowing that anyhow it matters to continue to resist. And keep trying. Hoping that somehow we will find an end to all this pain.